Advocates of hydraulic fracturing list the many benefits of the practice. The infographic above shows the four reasons cited most often. To think critically and scientifically, it is good practice to balance benefits against challenges, and people’s wants or needs against economic or environmental costs. In the science of sustainability we must always look at how today’s practices might impact people and Earth’s systems in the future. Click on the infographic above to see a larger version. Learn more about claims that hydraulic fracturing helps people. This infographic is part of a five-part educational series called Challenges of Non-Renewable Energy. How can people be persuaded to change their views or beliefs? How would you define a person who is an “advocate”? What do advocates do? What is a debate? Why might people debate the impacts of hydraulic fracturing? 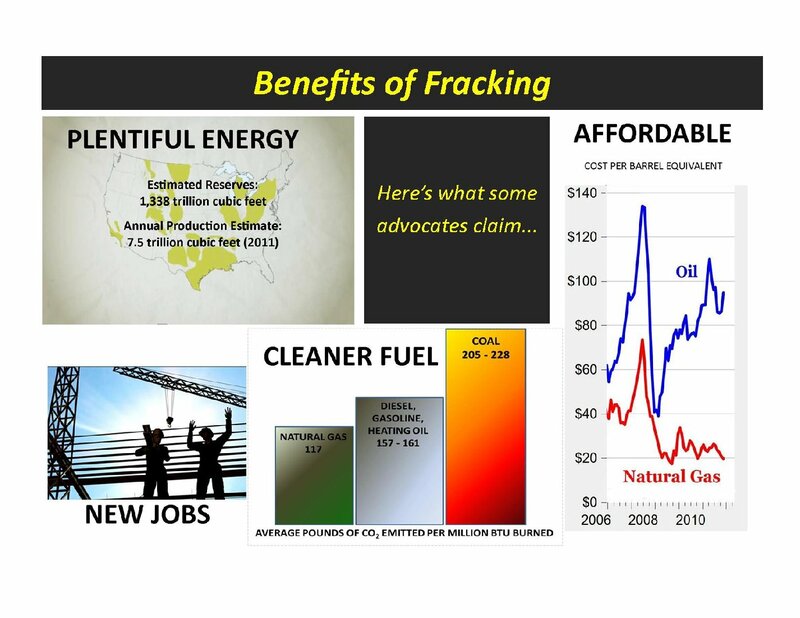 What claims do fracking advocates make with regard to the following? Which of the four points made in the infographic do you believe is most defensible? Why? Are there any points that you find hard to defend? What are they? Why is defending them difficult? Do you see any places in the graphic where some additional information may have been intentionally omitted to sway you toward favoring the idea of fracking for energy? Write an argument supporting the creation of an infrastructure that increases the use and distribution of natural gas within the United States. What do you think critics would point to as drawbacks to your plan? Where would you expect to find tension or competing priorities among people’s needs, economic factors, and environmental factors? Advocating for Domestic Supplies of Natural Shale Gas, EnergyFromShale.org: See what domestic energy advocates have to say about well construction and the use of natural resources. Are The Jobs Real? , EnergyFromShale.org: Read an advocate’s story about how fracking has provided new jobs in Lorain, Ohio, and other places where unemployment is high due to changing economies. Earth’s Natural Thermostat, PBS LearningMedia/WGBH Educational Foundation: View this NOVA segment to see how carbon dioxide emissions, created by the combustion of carbon-based fuels, can upset the balance between the sun’s radiant heat entering our atmosphere and that which is emitted back into space. George Viebranz is a mathematics and science content specialist with ideastream’s Education Division. He spent 32 years as a mathematics and science teacher and curriculum supervisor before joining ideastream. He has worked on more than 50 television and radio productions focusing on the improvement of K-12 mathematics, science, engineering and technology education. Prev What Are the Challenges of Fracking Natural Shale Gas Reserves? Next How Does Hydraulic Fracturing Work?